CAMPEPHILUS is an interactive video installation that speculatively remediates a loss of ecological memory through a physical commitment to stillness and the recognition of the residues of extinction. Part ecological ghost story/part ecosemiotic poetic; the work mediates sound and moving image from the ambient field recordings of lost habitat, bioinformatic characterizations, protein audio translations, digital zoological imaging and the bioacoustic taxonomy of the presumably extinct, Imperial Woodpecker (Campephilus imperialus). The Imperial Woodpecker is/was native to the ancient forests of the Sierra Madre Occidental of Mexico; including the remote territories of Chihuahua and Durango States and the Copper Canyon. Cited as the world’s largest woodpecker, the Imperial Woodpecker is/was sacred to the Tarahumara and Huichol indigenous populations of the Mexican Sierra for the curative powers of its’ plumage. Hunting and indiscriminant logging are chiefly responsible for the obliteration of the species and its’ breeding habitat. There have been no confirmed sightings since 1956 and no field photos or audio recordings have ever been captured of this specie. The visual elements of the work are made up of field video recorded in the lost habitat of the Imperial Woodpecker (the Mexican Sierra Madre and the Copper Canyon) and high-resolution digital image scans from early 20th century museum specimens of the specie. The habitat visuals have been paired with sonic translation from human cryptochrome (CRY1 and CRY2) protein sequences. 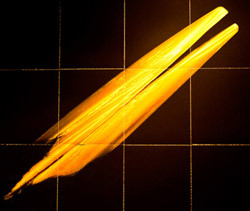 Cryptochromic proteins are sensitive to light, time and therefore direction. Conceptually these proteins may be linked to mapping and colonization and perhaps the ecological impact of many species. The sonic tracks paired with the Imperial Woodpecker image details are mixed from the bioacoustic field recordings of the surviving (and endangered) Campephilus family of the Americas: from the Guatemalan highlands, the Ecuadorian and Peruvian Cloud Forests and the forests of Patagonia. 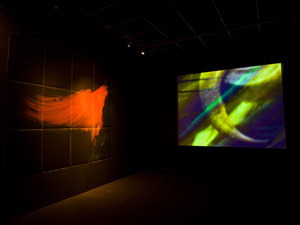 The electronic sensing in the installation space follows the motion of the audience in combination with autonomously tracking the video work itself to result in the final mediation of the visual and audio content of the work. As in many ghost stories, the sensory experience of this space brings forward an autonomy from the afterlife in tandem with response to the here and now. The CAMPEPHILUS installation is part of the digital cinema series HYLAEA that collectively explores the language, mediation and possible restoration of lost ecological memory through live cinema performance, experimental sound/video compositions and audience engagement in immersive/interactive environments. HYLAEA refers to the mythical and now lost forests of ancient Greece and to Humboldt’s explorations of the virgin neotropical forests of the Americas. The intent of this project is to collectively bring together disparate artifacts of lost ecological memory such as the deep colors and textures from extinct birds wings, sonic translations of the DNA and proteins of missing species and the ambient environmental sounds and images of lost habitat to create a series of immersive interactive sensory experiences for audience participants. The hope is that audience engagement with such immersive experiences may re-mediate the patterns of lost ecological memory as a means of facilitating a discourse into our present tense state of ecological consciousness in a time of cascading extinctions. 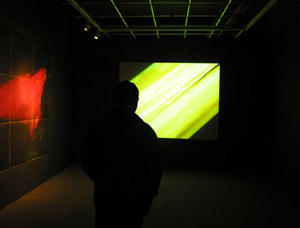 CAMPEPHILUS will run from February 6 - March 6, 2009 at the College of Santa Fe MOV-iN Gallery (M-F 10AM-9PM). Special thanks to: David Stout and the College of Santa Fe, Advanced Interactive Media Class, the CSF Moving Image Arts Program, MOV-iN Gallery, Denver Museum of Nature and Science / Wattis Internship in Zoology, and University of Denver, Creative Arts Material Fund for their assistance in the realization of this project.